By Dr Janelle Braithwaite, Senior Policy Officer - Marine Planning at Marine Scotland. How high do birds fly? When is it too noisy for marine mammals to hear? And are salmon particular about their migration pathway? Answering these questions is more than interesting science, it is vital knowledge to understand the potential effects of offshore renewable developments, such as windfarms, on Scotland’s marine environment. It’s questions like these that form the basis of Marine Scotland’s ScotMER research programme. Offshore renewable developments (wind, wave, and tidal) have an important role to play in tackling climate change. They contribute to the Scottish Government’s ambitious emissions reduction targets and energy strategy. However, these developments also have the potential to affect the marine environment, including socio-economics. We need to address current gaps in knowledge to fully understand these interactions to better inform the decision making process. To improve understanding and support sustainable development, Marine Scotland has established the Scottish Marine Energy Research (ScotMER) programme. This programme seeks to address gaps in knowledge and increase the level of scientific and socio–economic evidence available for developers, the public, advisors, and decision makers. ScotMER involves collaboration with industry, environmental NGOs, Statutory Nature Conservation Bodies (e.g. Scottish Natural Heritage), and other interested stakeholders. There are two parts to the ScotMER programme: creating evidence maps to provide a comprehensive framework of gaps in knowledge, and facilitating a research programme that is structured around this. The first step in the ScotMER process was to map out current gaps in knowledge around environmental and socio-economic interactions with offshore renewable developments. This aims to reduce risk by establishing a better understanding of effects. 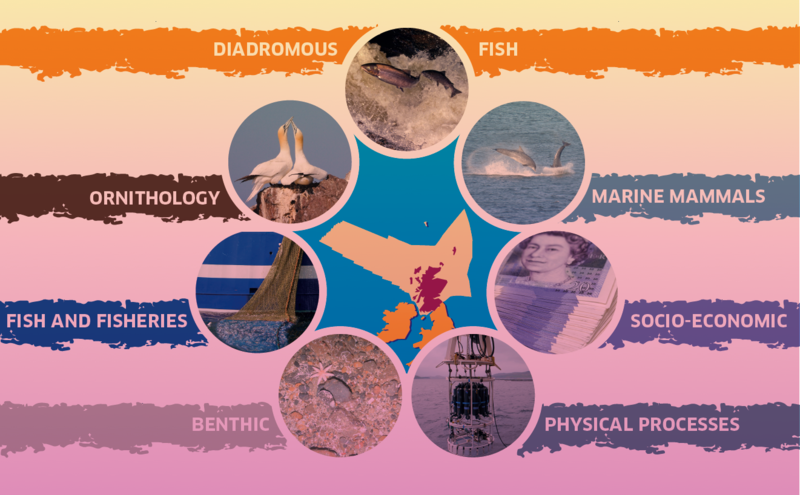 To do this, seven specialist groups were created to focus on key issues: ornithology, marine mammals, fish and fisheries, diadromous fish, benthic, physical processes, and socio-economics. Each group, made up of experts and stakeholders, worked together to outline and prioritise knowledge gaps, which were then detailed in an ‘evidence map’. These maps are now online and will be reviewed and updated as new scientific evidence comes to light or new knowledge gaps are identified. Marine Scotland is now facilitating high priority research projects identified in the seven evidence maps. This programme of research involves collaborations across Scotland, the UK, and Europe to fill knowledge gaps that are acknowledged to go beyond political and geographic boundaries. Issues we are currently researching include understanding seabird behaviour and risk of collision with turbines, how underwater noise generated from offshore developments may affect distributions of dolphins and porpoises, mapping the timing and pathways of Atlantic salmon migrations, and mapping sensitive areas for important commercial fish species. This is just a snap shot of the research Marine Scotland is involved with, and we aim to do a lot more to support the sustainable development of Scotland’s seas. To support knowledge exchange and encourage collaboration, Marine Scotland is organising biannual ScotMER symposiums to showcase recent research projects. In October 2018, we held our first ScotMER symposium on seabirds, and were delighted to welcome attendees from across industry, academia, nature conservation organisations, and advisory bodies. Paul Wheelhouse MSP, Minister for Energy, Connectivity and the Islands, gave an opening speech highlighting the Scottish Government’s commitment to progressing valuable scientific research. Our next symposium in March 2019 will focus on the interactions of marine mammals and offshore renewable developments, with fish and fisheries to follow later in the year. We will continue to work with partners to undertake research to improve our scientific knowledge, and seek to establish new collaborations to address the issues in the evidence maps. For more information, please contact ScotMER@gov.scot. With thanks to Dr Janelle Braithwaite and everyone at Marine Scotland.